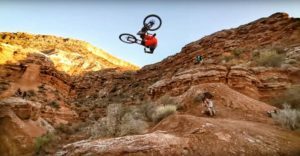 Behind the scenes footage of Cam Zink attempting the Cash Roll that stopped him riding in Red Bull Rampage. It looked like Zink had it nailed on the third attempt, but with a shoulder that prone to popping out he just couldn’t hold on to the bars when landing landing over the back of the bike. The crash resulted in a separated shoulder meaning Zink couldn’t compete in finals the following day.